Using rotisserie chicken in this recipe is a great timesaver. Preheat oven to 475°F and line 2 large baking sheets with parchment paper. Divide dough into 2 pieces and roll each as thinly as possible on a lightly floured board. (If dough is too elastic, let it rest for a few minutes and roll when it’s relaxed a bit.) Transfer to baking sheets and pull edges out lightly to stretch even thinner. Top with mozzarella, chicken and onion. 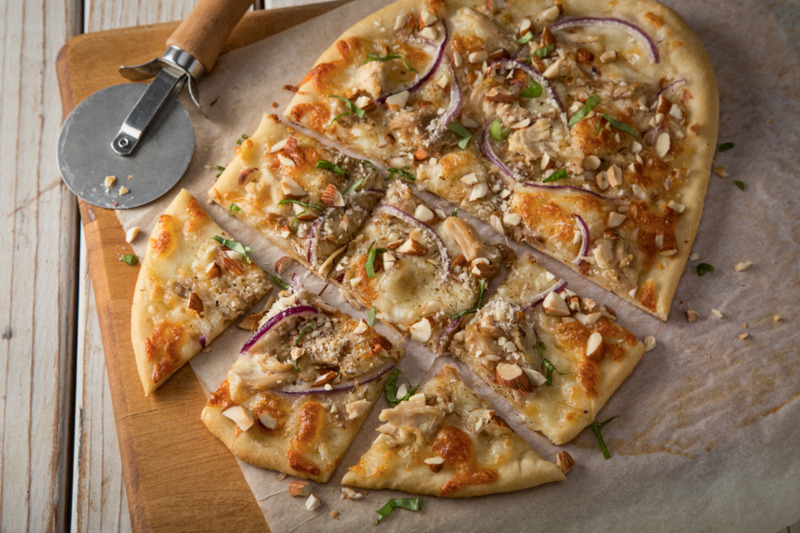 Stir together almonds, Parmesan, breadcrumbs and seasonings in a medium bowl and sprinkle evenly over flatbreads. Top with fresh basil, if desired. Omit chicken and top flatbread with 1 medium very thinly sliced tomato and 1/4 cup real bacon pieces. Toss chicken with 1/4 cup buffalo wing sauce. Omit chicken and toss 1 cup diced, cooked potato with 1/4 cup pesto.